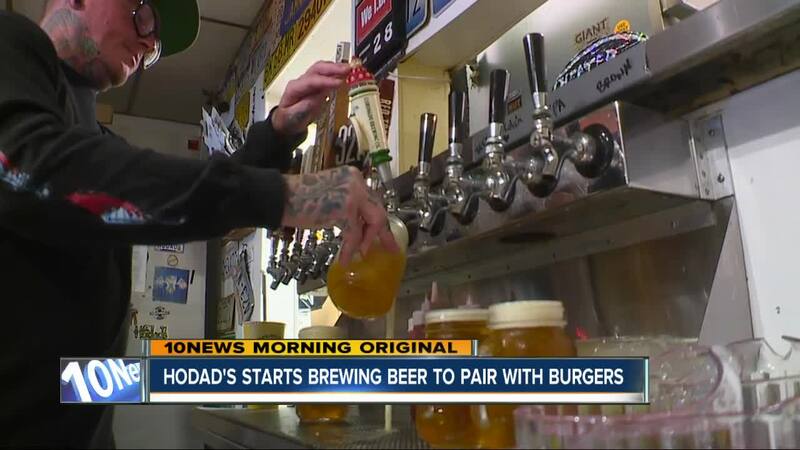 OCEAN BEACH, Calif. (KGTV) - The iconic restaurant Hodad's, best known for its burgers, is now branching out into the beer industry. The company has started brewing its own beer and is serving it in all of its San Diego locations. All four are the brainchild of Hodads manager Marlow Myrmo, who started brewing five years ago in his girlfriend's studio apartment kitchen. "We were tasting it and thought this is actually pretty darn good," said Hodad's co-owner Shane Hardin. "We kind of put two and two together and found a spot, and here we are. It was a pretty easy decision." Myrmo went to San Diego State University to get his Certificate in the Business of Craft Beer. In the meantime, Hardin began looking for a place to build a large brewing operation. They found a spot in Kearny Mesa, and like all of their restaurants, it has license plates on the walls. It also has a mural of late founder Mike "Boss Man" Hardin. "I think my dad would be stoked," said Shane. "He was clean and sober for 30 years, but he appreciated the industry of it. So, I think he'd be stoked." Hodad's started serving the beers in early November. Waiters said it's become the most popular beer on the menu. Hodad’s already has plans to expand the brewery so they can serve the beer at Petco Park this summer during the Padres’ 2019 season.